Eleanor Burns is doing a free block of the month, the first block having been released on August 1st. Each block will be released on the first of each month. https://www.quiltinaday.com/eleanora...nontheFarm.asp You don't need facebook to join, just if you want to enter for her monthly prizes. The pattern is easily downloadable without FB. There is no sign up or mandatory purchases. We can share pictures of our blocks, give tips and enjoy some chatting here. I have my block all cut out and ready to go. Anyone else? I'm going to join, this is too cute. I downloaded the pattern and I will work on it this weekend. 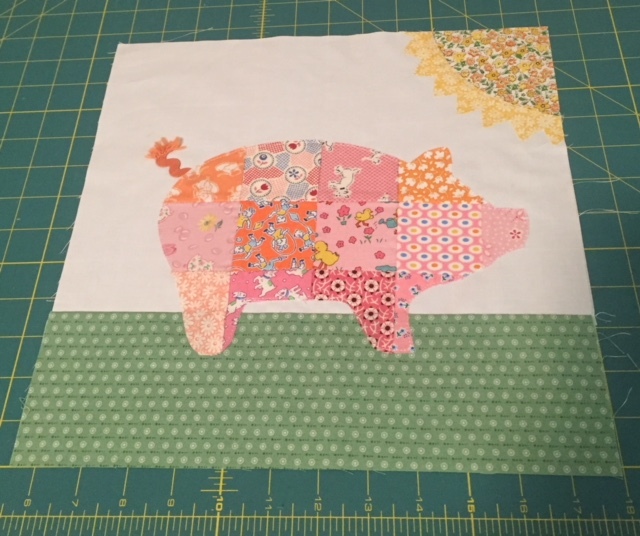 Well, one thing I found out, if you use heat'n'bond for fusing the piggie down instead of Eleanor's method, reverse the pattern. I didn't think of that and now my pig is looking the other way! He still looks cute so I don't mind. I can't wait to see more pigs showing up here! Thanks NZ, looking forward to seeing all the pretty blocks. I will be looking through the scrap bins and such to see what I am going to use. Adorable NZ. I love the rick rack tail. I have lots of that for making doll clothes for my granddaughters. Thanks for the tip on reversing the pattern. What fun, I'm in. Wonder where my rick rack is? I may have to look thru scrapbooking ribbon for a substitute. Happy sewing y'all. Good one, farmquilter!! We might end up with two flocks of pigs, going in two different directions! They will still be cute. Thanks for the link, NZQuilter! What a cute pig you have there. I have a lot on my plate right now, but will download the blocks to make some other time. how many of us will now be racing out to buy rick rack, all for the sake of one inch! paint it on with crayons or inktense pencils. Use a piece of bias "stems". Use a pink ribbon. Any other pigtail ideas? You could always hand embroider the tail if you have no rickrack or tack down some weird string or wool or even dental floss. That's one of the great things about being creative, there is stuff all around us waiting for a new purpose. I sure have lots of that in stock!!! 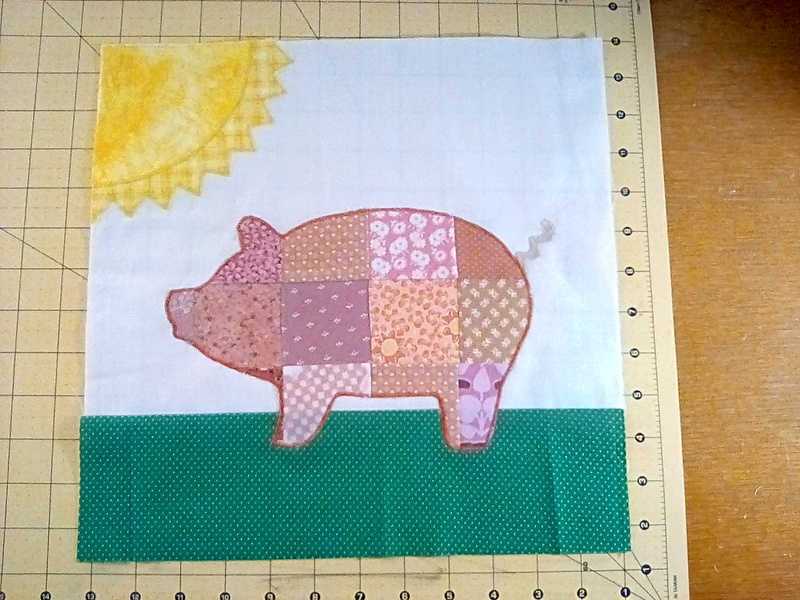 NZquilter your piggy turned out great. I also downloaded the pattern yesterday and will try to make it this weekend too. I'm in, too. Another inspiration project. Thanks for the post. I jumped ahead and looked at the lattice work finishing borders. I cant tell from the intructions how to make that cross. Its is a wonderful fence-like border, but, ouch! My little piggy is pink and orange. Well, I only had orange rick rack so, she's a pig of another color. I didn't like the 1/8" turn under fusible so I simplified with raw edge applique. Ooo Toverly, adorable. I love pink and orange together. Your pig is adorable done in reproduction prints.